This easy-to-read, concise book is filled with examples, hints, reminders and reviews designed to help engineers and scientists develop effective writing skills. Use the book to learn to write better reports, memos, and journal articles and keep it close at hand when you have questions about organization, clarity and style, writing and revising rough drafts, graphics, workplace writing, computers in writing, and legal issues in writing. The book also contains four helpful appendices on common errors, equations and abbreviations, preparing manuscripts for publication, and documenting information sources. 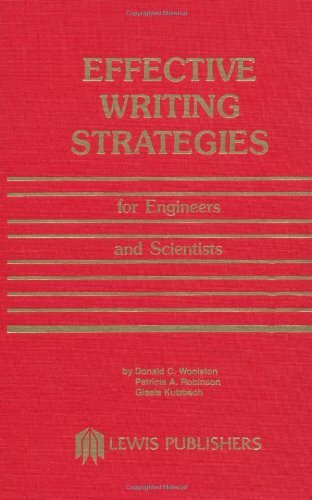 Effective Writing Strategies for Engineers and Scientists provides easy training for the type of writing required of engineers and scientists, gives specific advise for conveying complicated information, and describes how to synthesize information according to specific writing strategies. It is a "must" for every scientist's and engineer's bookshelf. If you have any questions about this product by Brand: Lewis Publishers, contact us by completing and submitting the form below. If you are looking for a specif part number, please include it with your message.